From a recent cruise with our first stop in the port town Toulon, France, I wondered what the heck we'd do in this city I know nothing of. I'm average at best with European geography and once I mapped it out, viola...we're going to Provence! 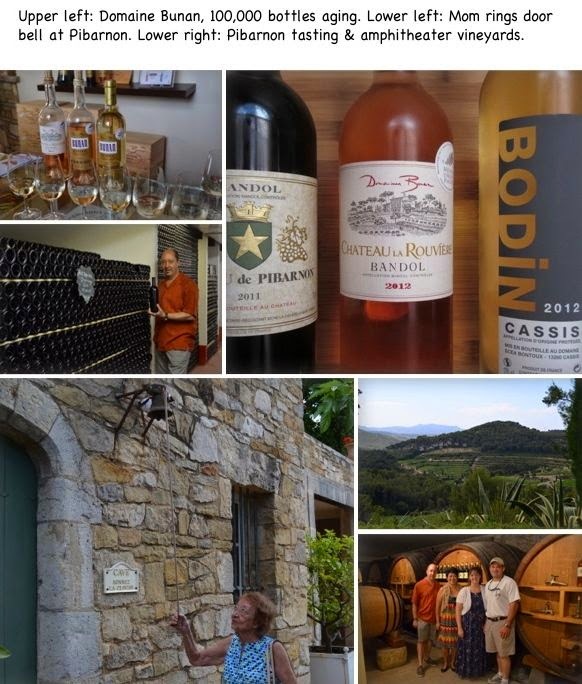 Marseilles was a bit too far a drive to spend quality time so I looked into the Bandol wine region after some great assistance from Provence Wine Tours. Bandol is known primarily for their rose wines however, some other great varietals are coming out of this region as well. Eric was our guide for the day and picked us up at our ship that morning. Our first stop was Domaine Bunan and the drive up through the hilly, single lane, stone road was an adventure in itself. Very different than winery tours in the US, Eric actually led us on our visit vs. winery staff. Having family with us who had not been to wineries before, we walked the production aspects of the winery first followed by our tasting. With my preconceived notion for many French wines being stronger on the "mineral" like flavors, I promised to opened my palette and I truly enjoyed the tasting. Rose was the wine of choice and my favorite was the Chateau La Rouviere. Made from a blend of Mourvèdre, Cinsault and Grenache this wine was full of floral aromas with hints of pears. Flavors were balanced with a refreshing combination of citrus, strawberries and peaches. I could see this pairing well with grilled sea bass, shellfish and spicy Mediterranean dishes. Our 2nd stop was Château de Pibarnon and upon our arrival, we were greeted to an absolutely beautiful view down into the valley. One of their vineyards was designed like an amphitheater with tiered walls separating the vines for optimum drainage. As we came up to the 18th century chateau my mom who was traveling with us was instructed by Eric to ring the large bell hanging over the front door. It was as if we were coming to someone's home. Our tasting was held in a stone walled room amongst their large oak vats used for aging. The Rouge was my favorite and with a 2011 and 2012 available to taste, I preferred the 2011. With 90% Mourvèdre and 10% Granache it had aromas full of dark cherries and plums. The flavor profile consisted of ripe dark fruits with a subtle spice on the finish. Prior to this, I've only tried Mourvedre wines from Spain and I must say as an alternative red, which most people don't hear about much, it was outstanding! The last stop was Bodin in Cassis . Quite possibly the most fun on our day, Eric clearly knew the tasting room staff well. We enjoyed laughing and trying many different selections from their portfolio. My favorite was the Blanc de Blancs, Cuvee Notre Dame des Lumieres. Fresh, clean aromas of citrus, nuts and honey. The flavors combined apples, mangos and a lemon finish. Absolutely a refreshing wine to be served chilled on a hot summer day. The blend consists of 30% Sauvignon Blanc, 30% Clairette, 30% Marsanne and 10% Ugni Blanc. For me not being up on this type of blend, it was definitely a wonderful wine to be enjoyed in hot weather with salads, grilled fish and no doubt a perfect accompaniment to any picnic.